When Alabama infrastructure, from roads to drinking water sources, is working, it doesn’t get much notice. Many of us assume all is well and we are prepared for the future. But Alabama civil engineers are a bit more concerned about public safety and capacity issues. They know it’s foolhardy to take our infrastructure for granted, since much of it is antiquated. That’s why the Alabama Section of the American Society of Civil Engineers (ASCE-AL) now provides a report card every four years so we can learn how our infrastructure is faring and ask our public representatives to take action as needed. Below is a brief summary. To see the complete report, visit infrastructure-reportcard.org/Alabama. Alabama’s 80 public use airports are generally considered to be in good condition with a relatively low percentage of maintenance issues and excellent capacity levels, but the infrastructure report points out a number of concerns for the future. The FAA current funding levels, for example, are lower than needed on a per capita basis to continue to fulfill Alabama’s growing capacity needs, according to the report. And the state of Alabama provides less funding, via Alabama Department of Transportation (ALDOT), than most other Southeastern states do for airport improvement. ASCE-AL also suggests a move toward more regional control of airports to improve cost efficiencies. Alabama’s hydroelectric power dams, 20 of the state’s more than 2,200 known dams, provide 5 percent of our electricity, the report notes. However, the vast majority of dams across the state, 83 percent, are owned by private citizens, including farmers. Unfortunately, Alabama has the distinction of being the only state without a Dam Safety Program, including safe design guidelines, critical dam inspections and maintenance — potentially threatening life and safety for a growing population living downstream — according to ASCE-AL. A State of Alabama aerial study, which was ongoing, has identified dozens of high hazard and potential high hazard dams. When it comes to drinking water, Alabama is among the top 10 percent of states for water quality provided to consumers. But the report warns that drinking water infrastructure such as water mains, tanks, plants and pumps, much of which was built from the 1960s to the 1990s, is beyond its 30-year projected lifespan. More funding is needed for repair and replacement of Alabama’s 577 aging systems, primarily small, non-municipal public corporations regulated by the state. Funding is also needed to expand rural systems to ensure new public facilities, including schools, have adequate water, especially for fire response. Our state is blessed with abundant traditional energy resources including petroleum, natural gas and coal. Nuclear power is readily available, as well as renewable resources including hydroelectric, solar and biomass power. ASCE-AL applauds that Alabama is No. 7 among the states in net electricity generation from renewable energy resources. Among the report’s recommendations to ensure Alabama remains an energy powerhouse: Address environmental regulations proactively, improve cyber security to avoid threats to the public welfare, closely monitor energy infrastructure to mitigate or avoid potential problems and streamline the permitting process for energy infrastructure upgrades and expansion. 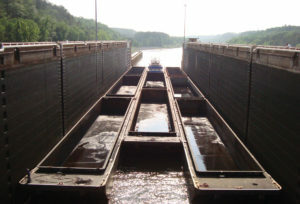 While Alabama boasts one of the nation’s largest inland waterway systems, most of its locks and dams were built in the mid-1950s and 1960s, outliving their 50-year intended lifespan. Because of increased demand and limited capacity, significant cargo delays are being experienced at some locks. Keeping inland waterways operational and safe, including those that serve the international Port of Mobile, is vital to the economy and essential for public safely, according to the report. Unfortunately national and other funding isn’t nearly on the level it should be to address current issues, including improving lock fill and empty rates, and future capacity needs. While Alabama’s coast is limited, the deep water Gulf of Mexico Port of Mobile is the 12th largest nationally by volume. The state also has several important inland ports — including Birmingham, Decatur, Tuscaloosa, Florence, Guntersville and Montgomery. To adequately poise the state for a bright economic future, ASCE-AL recommends that the Port of Mobile be dredged to its authorized depth and widened in needed areas. Federal and port authority funding for port infrastructure should be supplemented by state funds, according to the report. And new transportation projects and improvements are also needed, as well as an improved National Freight Strategy. Rail operations play an important role in the state’s multimodal transportation system, according to the report. We rank in the top 15 states in many categories of commodity freight use. Alabama’s rail systems — though regulated — are privately owned and operated, primarily by four railroad companies. Amtrak is the only passenger rail service, making stops in Anniston, Birmingham and Tuscaloosa. State funding is available to ensure public safety for railway bridges and potential railway-highway crossing hazards. ASCE-AL recommends the state work harder to provide a regulatory and financial environment that encourages greater private investment and passenger rail services from Birmingham to Atlanta. Vehicle traffic in Alabama has significantly increased in recent decades — 54 percent from 1990 to 2013, according to the report. The good news is that although more work is needed, Alabama has decreased its highway fatality rates in recent years. Of the 11,000 miles of federal and state highways maintained by ALDOT, about 9 percent have unacceptable or deficient pavement. Poor road conditions cost motorists an average of about $321 more each year in vehicle maintenance. Of even greater concern, according to the report, is congestion, expected to affect 17 percent of roads within the next two decades, unless funding — via higher fuel taxes — increases. Fourteen public transit systems and additional private providers operate across the state. But Alabama is one of only four states that doesn’t provide any state funding for public transit, forcing local transit authorities to delay bus, bus shelter and signage upgrades as well as limit park-and-ride lots and routes, according to the report. Birmingham leads the nation’s major metropolitan areas in the lowest percentage of working-age citizens using public transportation and has significant funding needs not covered by federal and local appropriations, the report points out. Those deficiencies could hurt economically during the 2021 World Games. Storm water and wastewater networks, which are managed by 250 area utility operators, are critical in ensuring safe drinking water, as well as controlling flooding and keeping rivers and streams clean. The report voiced concern that about 65 percent of the storm water and wastewater collection infrastructure across the state is beyond its projected lifespan. Of special concern is sanitary sewer overflows into rivers and streams because of system leakage. Also, about 25 percent of the state’s 850,000 septic systems are failing, affecting groundwater. ASCE-AL recommends that local utility operators be allowed by government to structure their rates to better provide for needed system maintenance and critical updates. Kathy Hagood is a freelance contributor to Business Alabama. She is based in Homewood.